According to Rideau Docks Ltd. in Ontario, it’s possible for camp administrators to winterize a dock on their own, avoiding the expense of paying an outside company to do it. First, determine whether a dock needs to be put in storage or can be left in place. If it is protected from the wind, it can be left in place. One way to gauge this is to measure the waves crashing on the dock--if they don’t exceed one foot, the dock is protected. 1. Loosen the anchor chains to allow higher water levels in the spring. 2. Flip up or remove ladders. 3. 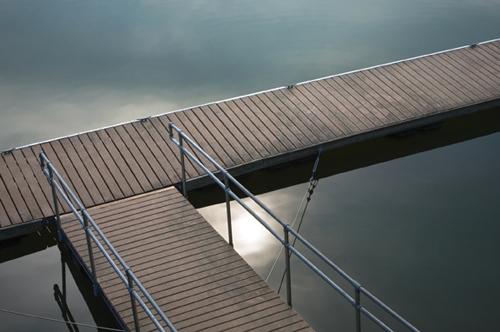 Remove ramp legs, place skid boards under the shore end of a ramp, or put a ramp up on shore/dock. 5. Disconnect any pipe feet bolted to rocks. 6. Tie a safety line from the dock to a fixed object on the shore. A chain may be the best line to use to prevent animals from disconnecting the line. 7. Check and tighten all bolts. If your dock cannot be protected from the wind and the high tide, look into alternative storage options. Otherwise, high winds may push a large ice mass into the dock, crushing it against a rocky shore. 1. Remove any posts, support legs or ladders, and store in a safe place. 2. Disconnect the ramp from the dock, and place it on the shore. 3. Disconnect chains from the dock, take them to shore, and tie them to a tree or similar fixed object. If they’re not long enough to reach the shore, add more chain or sturdy ½-inch (or larger) rope. (Do not attach chains to floating buoys as they freeze in ice and then thaw during spring; as the water level rises, the anchors may be lifted off the bottom, allowing them to drift away.) When possible, use a chain to secure the dock to protect against damage by animals. 4. Float the dock into a protected bay, anchor it away from shore with cinder blocks, and tie it to a fixed object on shore. You want to have the dock free-floating--away from the shore and rocks--so that when the ice expands towards shore and the land expands out, the dock is not crushed in between. Note: Another option is to follow these steps and store the dock and accessories in a storage unit. Some facilities offer this feature without having to pay for the winterizing of the dock. Information courtesy of Rideau Docks Ltd.